ASAP Containers in Omaha, NE provides excellent dumpster service to residential and industrial customers. 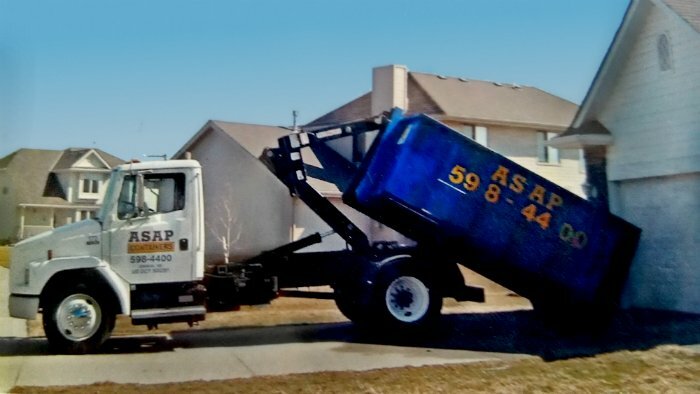 ASAP Containers in Omaha, NE provides excellent dumpster service for the removal of yard waste, garbage, concrete, roofing materials and other debris. We offer containers and roll-off dumpsters for all your waste disposal needs. Our dumpsters are of high quality and are available in various sizes. Whether you are a homeowner, contractor or an event planner seeking to clean up the waste, we have the right dumpster for your requirements. We offer same day service and are open six days a week for your convenience. We offer clean, safe and high-quality dumpsters to our customers. Our products and services are priced competitively, giving you a high value for money. Our dumpsters are equipped with wheels, which make placement simple and hassle-free. When you are ready for pickup, just give us a call us and we will be on the way! In addition, our trucks are designed to ease the dumpster right into the location where you need it most.